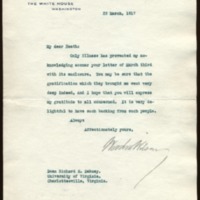 Woodrow Wilson writes to Richard Heath Dabney, thanking him for his continued support. Only illness has prevented my acknowledging sooner your letter of March third with its enclosure. You may be sure that the gratification which they brought me went very deep indeed, and I hope that you will express my gratitude to all concerned. It is very delightful to have such backing from such people. Wilson, Woodrow, 1856-1924, “Woodrow Wilson to Richard Heath Dabney,” 1917 March 22, WWP20519, University of Virginia Woodrow Wilson Letters, Woodrow Wilson Presidential Library & Museum, Staunton, Virginia.